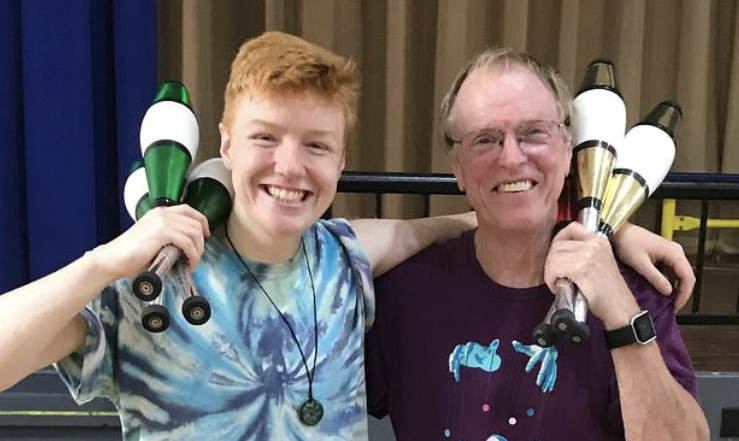 My dad started juggling with his brother using wooden clubs in the 60s. My uncle shared that he was juggling clubs for the junior high basketball team in 9th grade to demonstrate dexterity. So it is estimated that my father started to juggle around the age of 12 or 13 in his 8th grade year (1963-4). Their dad also used to join in; my grampa was also a character. Their Aunt Mary took them antique shopping/hunting and on one of these excursions they bought a few sets of Indian exercise clubs. There were 2 in each set, with each club weighing between one and two pounds each, and never a matched set of three the same size and weight. Eventually my uncle made a third club on the lathe in shop class, and the following year my dad made a set of 3 relatively matched clubs. Adventures ensued once they found out about IJA. 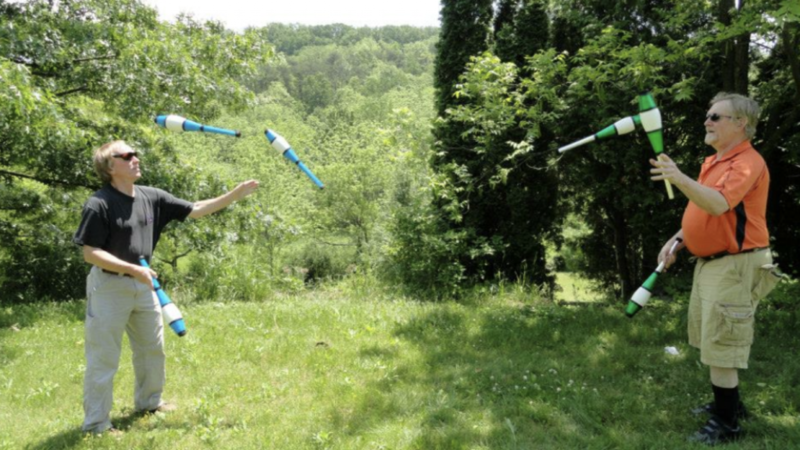 My teenage uncle with his new driver’s license drove them together to see crazy juggling feats: like the only man at the time they knew of who could juggle 7 was a drivable distance away in Allentown. They finally each got a set of Dube clubs at the start of college, when they could finally afford them. My dad had several partners over the years and traveled all over. They both became IJA members back around when there were only 200 official members registered. My uncle went to the IJA fest in 1981, and my dad attended in 1983. They always wanted to go to one together. This year, 2018, my dad took me to Springfield and we had a blast. 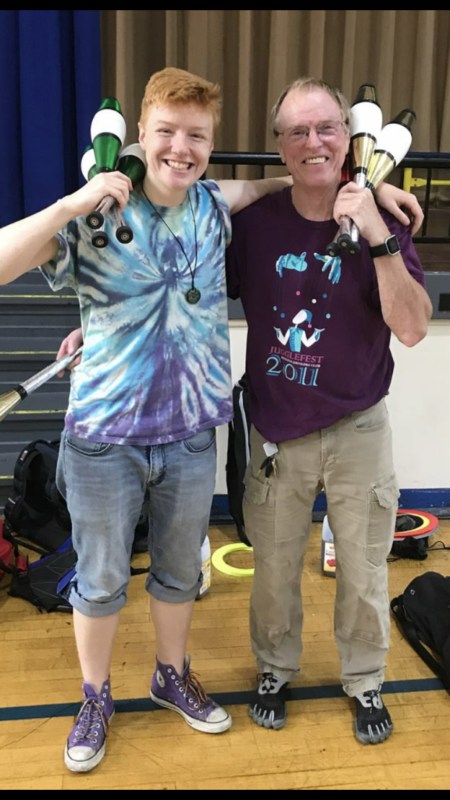 At his last one he and I purchased clubs and juggling balls for my older nephew, Elijah, who he had started to teach right before he left us. When I was little (5 or 6) we used to go to the gym at Kutztown University where my mom worked and he would set himself up with a giant Nike duffel bag overflowing with equipment. I would run around him and fall over trying to throw scarves and catch them. He would juggle all sorts. He could juggle 5 balls for a few seconds, but his favorite toy was probably his whistling diabolo. He stopped using it when he couldn’t find a new one, to preserve it as long as possible. According to my mom, my sister Jesse bought him a flashing one for his birthday just a few weeks ago (she couldn’t find a whistling one). My dad was all about ‘next’, sometimes he would just say that: “Next” and go work on something new. I never realized how much my father, who had ADHD, had taught me about patience. Most importantly, he taught me that regrets are useless. It’s about what you do, where you go. It’s about dropping over and over and over again. Learning is failing. So don’t beat yourself up so much while you’re trying to figure it all out. And don’t get too scared that you’ll fail or get so hurt that you stop trying. “What are you working on, where are you going?” he wanted to know. I never got to text him back before he left us. He was on to what’s next. But what I wouldn’t give to tell him. Or to hear him laugh or tell a stupid joke. What I wouldn’t give to juggle what he called ‘three-three-and-ten’ – three 6-count passes, three 4-count passes, and ten 2-count passes ended on a triple throw from left hand to left hand. We always warmed up with this pattern, one of his favorites, but we would usually make each other laugh so much that we would drop it all before we finished and then say that it was just our best and most classic trick: the 6 pin drop.